Developers behind some of the most notable projects in Miami-Dade County are vying to build out an area adjacent to the Douglas Road Metrorail station near Coconut Grove. 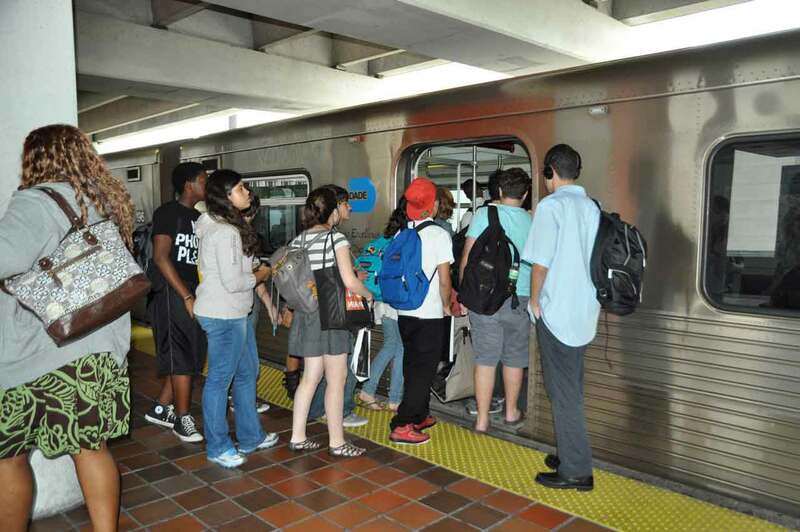 Miami-Dade government requested proposals for transit-oriented development near the station. Two groups responded, Miami Today learned through a public records request. The Related Group is competing with Adler 13th Floor – a partnership between the Adler Group and 13th Floor Investments. Related proposes a nine-story parking garage, a 17-story residential tower and a 17-story student residence. The Douglas Road Metrorail station is just northeast of the University of Miami. Related’s proposal includes ground-floor retail as well as office space, records show. Related is partnering with Miami-based architecture firm Arquitectonica on the proposed development. Adler 13th Floor is proposing 970 residential units, 288 of them in a 25-level tower that would rise on the northeast side of the development at Peacock Avenue and Douglas Road, as well as units at a mid-rise garden-style residence with ground-floor retail. The Adler team is also proposing 70,000 square feet of retail; parking; a public plaza with outdoor furniture and water features leading to Metrorail’s entrance; and a 150-key hotel. Adler 13th Floor is considering several hotel brands for the project, with a Hilton Garden Inn as one option, records show. The Adler 13th Floor team includes Boston-based Stantec as architect. The Adler Group and 13th Floor Investments are already partnering on another project, a 25-story luxury high-rise with 294 multifamily units in the Dadeland area. The county’s solicitation for proposals for development at and near the Douglas Road Metrorail station is a nod toward the latest trend of building transit-oriented development, essentially mixed-use, pedestrian-friendly projects where people can live and work as well as seek entertainment, all near a public transportation stop. Transit-oriented development has been touted as a way to attract more mass transit riders and to provide amenities, offices and residences for these riders near the mass transit stations. The plan at Douglas Road is one of many such projects ongoing in Miami-Dade. Another transit-oriented development is the Eighth Street Metromover station that’s being revitalized and is to be incorporated within Swire Properties’ now-rising Brickell City Centre. Miami-Dade has also solicited applications from developers to build at the Omni bus terminal in Miami. In transit-oriented development, the developer usually must upgrade the station. Both Related and Adler 13th Floor include in their proposals plans to upgrade the Douglas Road Metrorail station. Related said it would invest about $191 million in the project, including about $17.2 million to upgrade the station. Adler 13th Floor says its program, including common area contributions, hard and soft costs totals about $310 million, and the developer says it would invest $12.7 million in improvements of common property, such as parking and upgraded escalators. Which begs the question as to why the County waited 30 plus years to request proposals for transit oriented development next to MetrRail. Miami didn’t believe in transit oriented development. The Centrust (Miami) Tower was the only true integration with mass transit. The transit agency had to partner with developers to push this concept. Not until a downtown condo was built around a Metromover station, several years ago, did developers start taking the concept seriously. That makes sense, but you also have to look at Dadeland. The Datran Center complex was built along with Dadeland South. Much of the development around there, like Downtown Dadeland and other office and/or condo developments between there and the mall, had to do with the Metro even without being given specific incentives. Great point. This is a no-brainer. So much for mass transit bringing in undesirables and lowering property values.